I liked the first 2 "Royal Spyness" books. I read the first 2 books. The Royal Spyness series turned disappointingly episodic and predictable. At the end of the book, we are right back where we started, potentially ready for another adventure. No lessons were learned. No important characters lost. No important characters gained. No major changes in relationships. In short: Nothing permanent happened. Like a tired Sci-Fi series, Her Royal Spyness has now turned fully episodic. You can hot-swap Book 2 with Book 3 and not lose a thing. This may be OK if the mystery solving was actually interesting, but her Ladyship Georgie does no real sleuthing. She is basically just a narrator of the events around her. She reacts and is a soundboard to other characters thinking out loud of all goings-ons. She solves nothing. In fact, I'd argue the real hero is Darcy with his amazing spider-sense of always being in the right place at the right time. Book 3 should've been about him. The biggest disappointment was highly-predictable... the villain turned out to be 1 new character introduced early in the book. All the motives were spilled at the end, and then the villain was discarded. The deaths were minor characters. Everything got wrapped up all nice and neat. I am woefully unimpressed. The reason I prefer books to TV series is because characters actually develop and things actually happen to them. As it stands, I have no particular attachment to these characters. Georgie did not even embrace her most colorful fault: Extreme clumsiness. It only got a passing mention, like the author forgot to add it. Georgie was not even broke this "episode". She was at her family's castles and the only mention of needing finances were passing concerns about serving food and booze. Her attempt at job searching got a brief amusing chapter at the beginning. Finally, another bit of charm lost in this book: Interesting insights in to the lifestyle of 1930s British royalty were gone. So far, there are 12 books in this series. I just finished book 3. I'll be skipping the rest. I'd normally rate this a 2, but I do appreciate real endings, so it gets bumped to a 3. 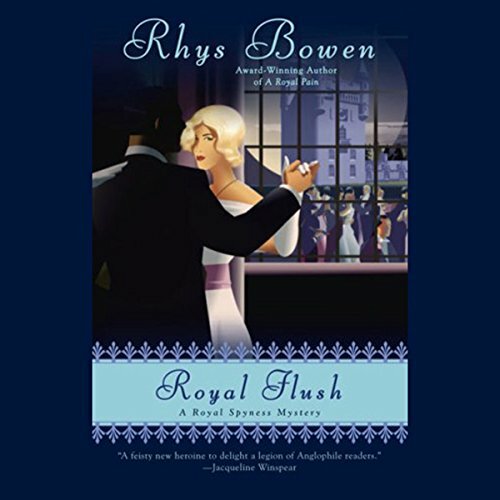 Discuss Royal Flush (Book 3) in the forums.